This is the Final Battle, Vs of course Zeus the King of the Gods. It starts off as a 2-D fighter style battle and this is the first battle of 3 yes 3 fights vs zeus! Battle one has 2 phases and is probably my favorite. It's intense its fun and you beat the crap out of zeus in it lol. Concentrate on using your jet boost and grab and you should take him down really really fast. Especially in fear kratos mode. Battle 2 is a little diffrent, zeus is actually harder, but it is timed based and all the player has to do is stay alive for about 1-2 minutes. Gaia will come and interupt the fight, which leads the the final battle part 3 inside the heart of gaia ! Battle 3 is the final and hardest battle of the Zeus wars. 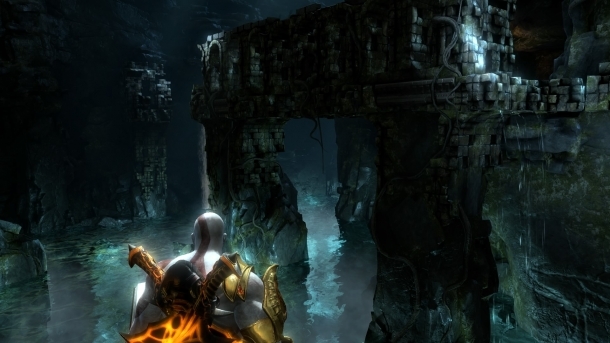 As fear kratos, it is not so bad because we are doing so much damage. ONce you get your ram + grab down, phase 1 is easy. Once he charges on Gaia's heart phase 2 begins. Since we didn't use magic in phase 1, or rage of sparta, now is the time to unleash hell. I suggest army of sparta for magic, then finally blade of olympus to finish Zeus off. You may need to get a little lucky, but it will work.